India has emerged as a “voice” in climate change and trade negotiations. At the recently concluded trade talks in Bali, the Indian government was insistent that the rights of poor farmers should not be compromised; in climate change it has raised the matter of equity in sharing global atmospheric space. The already industrialised countries say India is obstinate, strident and unnecessarily obstructionist in crucial global debates. The problem is not that India is loud—that it must be. There is a fundamental weakness in the rules that govern ecological and economic globalisation. In other words, the political globalisation is weak and compromised because of powerful self-interest of powerful countries. The problem, in my view, is that India is loud but not clear. It, therefore, makes noise but does not achieve its stated goal: protect the interest of the poorest in the world. But first let us understand the two processes. It was in the early 1990s that the world first finalised the climate agreement. The UN Framework Convention on Climate Change was signed in 1992 at the Rio Conference. The climate agreement was needed because economic growth had outstripped the ecological boundaries of the planet. The stock of greenhouse gas emissions was more than what the earth’s natural cleaning system—sinks in the form of oceans, atmosphere, forests and soil—could absorb. The world needed an agreement to reduce emissions, which were the result of economic growth. But most importantly, these emissions were no longer the problem of any one country. In fact, it was clear that the levels of production and consumption had reached such a point that the actions of one country within its boundaries were going to have major and devastating impacts on other countries. Just consider this: by then the world had learnt that a simple home refrigerator, which used a chemical called chlorofluorocarbon could literally blow a hole in the ozone layer and lead to skin cancer. Then traces of persistent organic compounds like DDT—a pesticide used for virtually everything at that time—were found in the breast milk of women living in faraway Arctic region. Ocean currents and air streams knew no national barriers and carried these chemicals across the globe. The world was interconnected, brought together by the excesses of economic growth. So it was not good enough to set rules in individual countries to mitigate environmental damage. It was time to create new rules for a global system of environmental governance. Since then the world has stitched up many agreements, from the ones on the protection of the ozone layer and climate change to those on the management of hazardous waste, elimination of persistent organic pollutants like DDT and in 2013 on mercury use. These agreements together form the architecture for ecological globalisation. In the 1990s another global process was under way—the setting up of the multilateral trading system under WTO. This economic globalisation would take production and consumption to new places and new levels. It would no longer be possible to live within the planetary boundaries. Instead the trading system enjoined all countries to the same pattern of growth and its toxic fallout. This is where the world is today. It has changed and yet not changed. On the one hand, manufacturing has moved to new countries and so have greenhouse gas emissions. In 1990, industrialised countries together accounted for 70 per cent of the annual global emissions. In 2010, they accounted for 43 per cent. In 1990, China, with over a quarter of the world’s population, accounted for only 10 per cent of annual emissions. By 2012, it contributed 27 per cent. On the other hand, there has been no change in the way the world does business. The West has not reduced its obscene subsidies to its farmers. In global trade negotiations it has simply played games to move them from one box to another; renamed and reworked them. The farmers of the developing world continue to be at a huge disadvantage. Similarly, in climate negotiations, the West has not reduced its emissions, so countries like China occupied the little ecological space that was available for emissions. Now the world has run out of atmospheric space and certainly of time. The fight is now even more contested and nasty. In climate change negotiations, the industrialised West wants to dump the 1992 agreement that required them to reduce emissions and share the atmospheric space with growing countries. They say the world has changed—emerging countries are now their competitors in trade and pollution, and they cannot make any concessions. In agriculture they want restrictions on the subsidy bill of developing countries. The just-concluded WTO meet in Bali is an indicator of the stakes involved. At this meet, the support price paid to poor farmers was considered a distortion of global trade. India was vociferous in its opposition to this. But the final Bali deal on agriculture is ambiguous and could hit the support to poor farmers. So the question is: has India been successful in fighting for the rights of the poor or has it only made loud noise? And why? Let’s discuss this next fortnight. It is argued by the IPCC that models that predict future temperature scenarios are based on physical principles but at the same time accepting the fact that there are several other localized or globalized factors contributing to it. Such factors are rarely accounted for in their models. Thus, there are no clear cut physical principles concerning global warming. It is basically statistical inferences that vary with data and period. The IPCC uses the number of people accepting the predictions to validate it. In science, unless they are verified by ground realities, they are generally termed as Ã”Ã‡Â£hypotheticalÃ”Ã‡Ã˜, which has no meaning in science. The IPCC is sensationalizing the impacts based on such hypothetical predictions on several processes, including agriculture. The IPCC, UN, Media, agencies like World Bank, Oxfam, CGIAR, etc. 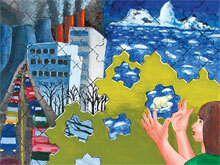 are using Climate Change as synonymous to Global Warming. This is not so; Global Warming is one component of Climate Change in which natural variations play vital role with extremes forming a part. The World Meteorological Organization of United Nations (WMO/UN) published a manual on Ã”Ã‡Â£Climate ChangeÃ”Ã‡Ã˜ as far back as 1966. It dealt with methods to separate man-induced variations from natural variations. Natural variations are beyond human control, only we have to adapt to them. On the contrary, the impact of global warming must present a trend, increasing or decreasing to ascertain its impacts. The IPCC and UN bodies are talking about individual events that are part of natural variations as associated with increased global temperatures. These are highlighted by the media with misleading headlines. By attributing the impacts associated with normal climate extremes within the limits of Climate Normals and rhythms present in meteorological parameters to global warming is dangerous. Now the IPCC itself has agreed that 100% of the raise in global temperature is not associated with the raise in Anthropogenic Greenhouse gases and agreed that around 10% is contributed by urban-heat-island effects Ã”Ã‡Ã´ this contributes to rise in night time temperature and lower layers of troposphere temperature. These are localized effects. Same is the case with changes in land use and land cover, known as Ecological changes. The majority of meteorological stations are in urban areas and thus urban-heat-island effect is going to be added to global warming component and on the contrary meteorological stations are sparsely located in rural areas that generate cold-island-effect due to increased activity of irrigated agriculture and spread of irrigation reservoirs is not going in to global warming component Ã”Ã‡Ã´ however, this may create a trend in precipitation at local and regional scales like that seen in AP precipitation. In all around 50% of raise shown under global warming is influencing the local and regional aspects but not national and global aspects like sea level rise, ice melt, etc. Southern hemisphere with less number of urban areas, with less ecological changes and with more area under ocean waters showed lower temperature rise over the average pattern. In the case of Northern Hemisphere with more urban areas, more ecological changes and with less area under ocean waters showed higher temperature rise over the average pattern. It is a fact that in the last 17 years there has been no significant change in temperature, including ocean temperatures; ice melt in Arctic and Antarctic zones are within the standard deviation around the mean; no change in precipitation Ã”Ã‡Ã´ monsoons, etc. In association with local conditions and natural disasters the sea levels show rises in some places, falls in some places, and no change in the majority of places. Ice is confined to outside the South Polar Ring and inside the North Polar Ring. That means South Polar ice melt is the true reflection of global warming impact on ice melt. At present it is not showing any melt in the Southern Polar zones. The Southern Polar zones are on the contrary building ice. North Polar zones are losing the ice but this is within the long-term standard deviation around the mean Ã”Ã‡Ã´ within the accepted statistical terms. In the North Polar zone, impacts other than climate are also contributing to ice melt. Alaska shows a large fall in sea level. Along the USA coastlines, a large part showed a 0 to 1.0 feet fall, this may be associated with human activity along the coastal zones, tidal erosion, etc. [San Francisco airport does not show any sea level rise]. Also, error variations are far higher than the estimated rise, which is not statistically significant. In addition, all these localized natural variations play a vital role Ã”Ã‡Ã´ even the global temperature showed a 60-year cycle Ã”Ã‡Ã´ sine curve. Cyclonic activities including Hurricanes and Typhoons Ã”Ã‡Ã´ and precipitation, all present cyclic variations. With the growing population of the planet, and building more structures in the path of cyclonic storms Ã”Ã‡Ã´ that includes Hurricanes & Typhoons Ã”Ã‡Ã´ and Tornadoes, and thus this makes ordinary storms more damaging. Food production, food security & nutrition security are not affected by global warming. Floods and droughts are part of rhythms in precipitation, however, their impacts are modified by agriculture technology and ecological changes. Food includes not only agricultural products but also include several others such as Dairy products, Poultry products, Sea & Water products [fish & prawns], Animal products [meat], etc. These are affected by agriculture technology and pollution components and not by global warming as crops adapt to temperature regimes which is evident from extremes in temperature given under climate normal data. These, along with ecological changes are the major contributors of destruction of biodiversity Ã”Ã‡Ã´ on land, in water including oceans. Pollution, more particularly from new agriculture technology, is the major source of health hazards globally and not associated with Global Warming. Global Warming is in fact a brain-child to counter the Environmental Movement against pollution, more particularly agriculture pollution, initiated in late 60s and early 70s. In the agricultural perspective, these matter: stop wastage of food; plan better utilization of water resources; shift from chemical inputs to organic inputs technology that help reducing pollution and public health aspects; do not forget that the losses due to intense weather systems increase with the population growth. Globally, cold waves are affecting many more vulnerable people than heat waves. Wild fires have nothing to do with global warming. Dry weather helps spread of fire over wet weather, which is nothing to do with global warming. I am with your arguments they are strong vis-a-vis IPCC conclusions. We must distinguish between Global Warming and Climate change; short period climatic variations and extreme events etc. needs more study /scrutiny to understand the global climate parametric trends. I think focus should be Sustainable Living and climate change/ global warming and many such other 'hyped/sponsored' topics should be discussed contextually only if relevant and further depending upon its impact in relation to myriad other factors which weigh lot more heavily.Moreover these other factors are not only addressable (by affordable appropriate technologies and benign policy measures) but also cost much less with substantial measurable curative/ameliorative value unlike clean technology drive and carbon trade which is more of a hype suiting greenfield and green business ventures. Leaked IPCC WGii report raises question about veracity of intensity of human effect on climate change in comparison to cosmic effect ( particularly Galactic Cosmic Radiation). One statement in the article is confusing. It is "in 1990 industrialised countries together accounted for 70 p.c. of annual global emission. In 2010 it is 43 p.c." That means they have reduced emission or developing countries have very much increased . Actual figs. would make matters clear. To be impartial developing countries could have indusrialised in a different manner in which emission would be smaller. e.g. Using solar power instead of thermal.Concentration on production of buses instead of cars etc.